Some gorgeous variations there. 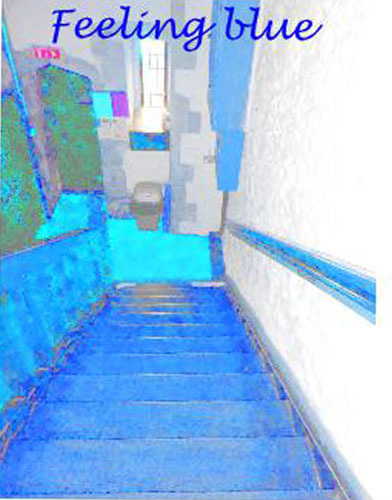 And just a touch (in the title particularly) of Royal Blue, my football team’s (Birmingham City) colours 🙂 You could almost dive into that ‘pool’ at the foot of the stairs. Yes, I suppose it does look like a pool at the foot of the stairs. Ah, the Birmingham connection. I might have told you this already (old age and all that) but Mister Potter is of Brummie extraction, so I can always depend upon him to speak his mind. He doesn’t believe in depression, which means I’m not allowed to stay “blue” for long. I would worry about falling and ending up in the bin. That reminds me of a cat I once lived with called Elli who was always getting her head stuck in tin cans. It’s only a plastic swing-bin, so I think you’d just end up fighting it and winning! Not totally wordless, eh? Hee hee hee… those are some steep stairs!! Ahhh…I hear you! Compuer programmes often frustrate instead of help! Hee, hee, hee. I think you’re probably right, but not driving open-topped with that vicious northwesterly bite in the air. Love the art work, beautiful blues…but hope you’re not feeling blue Sarah…. Such a bluetiful image, Sarah. 🙂 Gorgeous shades. Thank you, Sylvia. Glad you appreciated my attempts to match a picture to my mood 🙂 Today, I’m in a golden mood, as the sun is shining and I’ve banished procrastination. Yes, I remember your pictures from Normandy, Joss –especially the blue door. The colour blue is so calming!! I love this process in the image. But yes I understand the blues too well! I agree, blue is very calming. This image manipulation thing is opening up all sorts of new creative doorways to me. Still so much to learn and feeling very stretched by it, but that’s good for the brain, I’m sure. My favourite colours – I’m waiting to see what you’ll do next with this new program! I’m waiting to see, too! Am going to have a go embedding a haiku into a picture soon. Sarah, did you do this artwork? If so, I had no idea you were such a talented artist! It is really beautiful. I can paint quite well, but not as well as that!. It’s one of my photos, after I’d played with on my computer with Gimp and Scribus. I’m learning to use these two programs, with the ultimate aim of designing my own book cover! It’s beautiful! What a great program, and goal. Have you shown any of your paintings on your blog? I’d love to see your work. They’re all up in the attic, so it depends if I can face the spider’s webs and fighting my way through the clutter. Probably easier to paint something new. At least my art materials are accessible. They are in a cupboard in my home office, which is north-facing, meaning the light is perfect for painting.